Pep Guardiola’s side made it seven consecutive wins on Tuesday night with their 2-0 win over Shakhtar Donetsk in the Champions League. The Blues, who sit pretty at the top of the Premier League going into the latest round of matches, visit Stamford Bridge this Saturday to face their toughest test of the season so far against Chelsea. City will face off against the current Premier League champions in what is being touted as the biggest game of the season so far. Despite City losing both games against the West London side last season – the only side to do a league double over Pep Guardiola’s City – the results did not reflect on the performances in both games. Although champions last year, it is worth noting that Chelsea did not play any European football which meant their squad was less exerted in their Premier League pursuit. The Chelsea boss, Antonio Conte, himself criticised fixture scheduling this week after his side played away in Madrid on Wednesday night, despite City playing the previous night within the comfort of the Etihad. However, the Chelsea side we’re likely to face has seen several new additions to last season’s outfit. Conte invested heavily in the summer, bringing in former City man Willy Caballero, Antonio Rudiger, Tiemoue Bakayoko, Danny Drinkwater, Davide Zappacosta and star man Alvaro Morata to bolster his title-winning side. Despite their Burnley blip, the Champions are now unbeaten in five games and now sit in third place – just three points behind City. Despite only being three points behind City, Guardiola’s side are flying high right now, with a +12 goal difference over the London side. The Sky Blues also lead the way in clean sheets and chances created, a scary opposition for anyone to face right now. 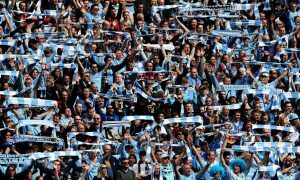 With the Citizens so far unbeaten in the Premier League, confidence is high in the Etihad camp and both players and fans alike will be in high spirits going into this game. Whatever the outcome, Saturday evening’s game is set up to be a thrilling encounter. Conte has had his work cut out so far this season with injury troubles and numerous suspensions. Both Eden Hazard and new signing Danny Drinkwater have started the season in the treatment room with the former only getting his first start last week in the Carabao Cup against Nottingham Forest. With both Gary Cahill and David Luiz already receiving red cards this season, Conte has been forced to deploy four different back lines in the first six games of the season. A selection nightmare for any manager to face! 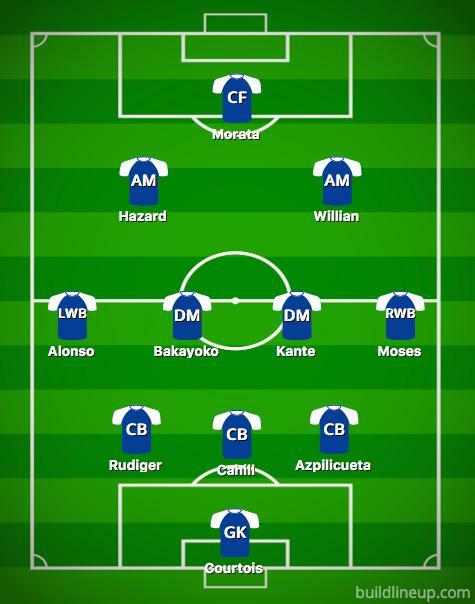 The ever-present faces of Courtois, Azpilicueta, Moses, Alonso and Kante will all be likely to start this weekend with star man Morata leading the line in the Blues preferred 3-4-2-1 formation. Moses and Alonso will be deployed as wing-backs with Bakayoko and Kante in holding midfield – creating the bank of four in front of the defence. Hazard and Willian will play the supporting roles just behind Morata in a strong formation which has seen Conte’s side play so well in recent weeks. Chelsea’s main signing over the summer window was their new striker, Alvaro Morata. The former Real Madrid star has adapted to life in the Premier League extremely well, scoring six goals in his first six appearances, including a sensational hat-trick last weekend against Stoke. Morata has replaced fellow Spaniard Diego Costa in great fashion, scoring his six goals with just eight shots on target in the Premier League. He has also registered two assists this season, taking his goal involvement to eight – 66.67% of all of Chelsea’s goals. Despite the well-known, and obvious, threats of Eden Hazard and Willian, Alvaro Morata is so far Chelsea’s man to watch with his deadly finishing and incredible movement off the ball. On his current form, Morata is a terrifying prospect to face and City’s backline will have to be on their best form to stop him scoring. It has to be Eden Hazard. To be fair Alvaro Morata, Tiemoue Bakayoko and N’Golo Kante will have important roles to play if we are to be successful, however it has to be the Belgian magician. We saw the other night against Atletico Madrid in only his second start of the season just how much of an influence he can be for us. When he picks the ball up he literally gets bums off of seats. When on his game, he is simply unstoppable and if we can keep him fit and play him where he wants to play, he would have a big, big say on how Chelsea get on this year. You have one of the most organised sides in the Premier League up against free scoring Man City. Chelsea are strong from back to front, whereas questions remain over City’s defence up against strong opposition. Sergio Aguero will be a big miss for Pep. Chelsea to win 2-1. Right now, I would take the top three and a sustained period in the Champions League as a successful season bearing in mind how City and United have improved their squads this season. However, I still think that when you compare the three sides from back to front Chelsea just have the edge. Chelsea to win the League with City second, Tottenham third and United fourth.